I will start by being honest with you- painting your kitchen cabinets can be a daunting task. But it can also be tremendously rewarding. Painting your kitchen cabinets can transform your drab and dated cabinets and give your whole kitchen a new lease of life. And although it’s not necessarily an ‘easy’ project to take on, it is very doable, especially if you have all the information you need before you begin. And voila, here it is! Here is an in-depth look at what paints to use (be that brilliant white or daring colors), what tools you will need, some handy tips and tricks to make the process as easy as possible and which brands and paints create the best results. White Paint vs Colored Paint? Before delving into the world of paint, the first thing you need to consider is what primer you are going to use. Priming is a crucial step in your transformation project and can make or break the whole venture. I would suggest avoiding products that state they are both primer and paint- the results can vary massively as they don’t fully fill either brief. 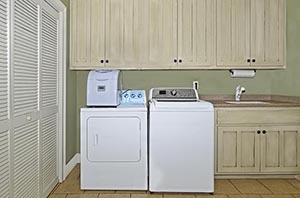 Waterborne or latex primers are best as long as you have sanded the cabinets down to the bare wood. Oil primers can also be used to provide the required undercoat and do provide a good coverage. However, they do take a long time to dry so can extend the time-frame of the project. The primer gives the paint something to stick to and helps create a smooth finish to the cabinets once they have dried. In basic terms, the paint that will create the hardest finish are going to provide the best, and longer-lasting finish. Kitchens are the hub of the household and encounter a tremendous amount of traffic, not to mention grease, dirt and food splatters. The paint you use needs to be durable enough to withstand all the action of the kitchen, and the cleaning that goes with it. A lot of think that eggshell paint is best for both kitchen and bathrooms. To all those people, I disagree. If you want a paint to withstand the heat (pardon the pun), I would recommend a satin, gloss or semi-gloss paint. These paints are all alkyd and dry with the hardest finish so are much more practical for kitchen cabinets. Similarly, to its primer equivalent, oil paints do create the desired finish on your kitchen cabinets, but they do take a long time to dry and can be difficult to clean up in the aftermath of your painting project. Waterborne acrylic enamel paints are your next option. This paint is quick-drying and does provide a hard finish but without any of the toxic fumes of oil paint. However, the paint does dry very quickly which means it can be hard to use for those who haven’t used it before. However, the paint does dry very quickly which means it can be hard to use for those who haven’t used it before. It does have a habit of hardening on the brush which means that it can leave streaks on your cabinets. If you are comfortable using this type of paint, it will give excellent results, but I would suggest its more for the seasoned painter. The final option is latex paints. These paints dry much quicker than their oil paint counterpart and any spillages are easy to clean up with water and soap. All these paints provide an excellent, glossy finish that should withstand any scratching or chipping. But as an extra precaution, I would suggest one final sand of your cabinets before applying a satin polycrylic or polyurethane finishing coat to ensure the longevity of your cabinets. Painting your cabinets is by no means a quick task, so don’t think that you’ll be able to complete this project properly on a dreary Saturday. The first thing to take into account before you even start your paint job is what material your cabinets are made out of. Wood and MDF cabinets provide the best surface for painting as they are able to be sanding down so the paint adheres properly. Laminate, plastic or ‘shiny surfaces’ aren’t as good. That is not to say they can’t be painted, but the results won’t last as long and the results can vary massively. Sanding: it will be your best friend and your worst enemy by the time you’ve finished. As mentioned previously, any wood cabinets need sanding down to the bare wood before you start priming or painting. But unfortunately, that is not where it ends. After each coat, you will need to lightly sand your cabinets again and clean them down before applying the next coat of paint. Remember when I said this was not a quick task? This may seem tedious but is an unfortunate necessary step you need to take. And then if you decide to use a varnish coat you will need to repeat it once again. So yes, it’s a drawn-out process but the results can be magical. However, if you decide to cut corners, the result will not be high quality and long-lasting. Whether you decide to paint your kitchen cabinets white or with color is completely down to personal preference. But here is my guide to whether to go for classic white or bold color. The first thing you need to take into account is your cabinets surroundings; the color of your walls, appliances, and even floor. And are you going for a classic feel or a more modern influx of color? Neutral colors always add a bit of class to any kitchen, but this doesn’t have to be bright white. White, beige or greige (a mixture of gray and beige) provide brightness and class to any kitchen, whilst also making the kitchen look bigger. If you do have a small kitchen, you want to try and keep your cabinets as light as possible to give the illusion of space. If your kitchen is already quite colorful, it is best to go with neutral colored cabinets to prevent your kitchen from being overpowering. 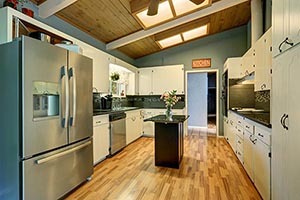 But if you are a bit more adventurous, there are lots of techniques and paint color choices that will add a bit of fire to the kitchen. If you have a neutral kitchen, bright yellows, lime greens (or even emerald if you’re feeling particularly daring), light blues or mint greens look spectacular. If you really want to push the boat out, a dark gray or navy looks endlessly classy in a neutral kitchen. But who says you can only choose one color? There are many options out there if you want to take that extra step. If you want to have a bit of fun, you can choose two different shades of the same color. If you decide to take this approach, do your top cabinets in the lighter shade and the bottom cabinets in the darker shade. You could even create an ombre style finish by using different shades of the same color on your cabinets to create a real WOW factor. Durability and style- that is what you want from your kitchen cabinets. With so much action going on in there, you don’t want to make the cleaning any harder than it needs to be, but you also want to WOW your friends and family with your style. With so many paint products on the market, it can be daunting to make your decision. But never fear! The following are the best paints on the market for painting kitchen cabinets according to the buyers who have tried and tested them. This paint does exactly what it says on the tin. It’s a top quality acrylic paint which is also VOC-free (a fancy way of saying to doesn’t release all the toxic fumes associated with paints). In a staggering 34 color varieties, there are no ideas that are too wild. It has excellent, quick-drying coverage, coating most items in just two coats! Although the can does say that priming and sanding are not necessary, I would still suggest investing time in these steps; they will only make the end result even more spectacular! By applying a polycrylic top coat over this paint, you will have cabinets that will not only be easy to clean but will last for years and years without scuffing or scratching. And it’s not limited to just wood projects, this Renaissance paint covers everything from wood to plaster, glass, and metal. It does sound like a little can of miracle, and that’s why its placed firmly in our number one position. INSL_X is an acrylic satin enamel which means that it is going to adhere perfectly to your kitchen cabinets without any bubbling or ripples. It dries hard and is easy to clean; what else could you ask for? So why only number 2 you ask? Well the paint itself is quite thin and can be a bit messy to work with because of this. Its consistency also means that your cabinets will also need at least three coats to get the required coverage and smooth finish. But don’t let this put you off- if you are willing to persevere then the results are beautiful. Not only this but this can is the thrifty option, because of the thin consistency a gallon can is easily enough to cover your kitchen cabinets with enough left over to perhaps use on another project. Transformation kits are becoming the popular option for home improvement projects as they provide everything you need in one handy kit. This Rust-Oleum kit contains: an instructional DVD, deglosser, undercoat and top coat, sanding pads, stir sticks and cleaning cloths. But one of the major advantages of these kits are the fact that they state that you can use them with laminate cabinets, which can be difficult and expensive if you’re going to buy all the equipment separately. Another bonus is that, as long as you’re not using the decorative glaze, you can use a spray gun to speed to process along even more. A lot of people say that these kits are ‘cheating’- I disagree. This kit takes all the stress of going out to buy all the product separately and provides more than enough to get the job done. But be warned, this kit is very much the ‘classy’ look. If you require something with a little more punch, then this kit is not for you. This is a water-based acrylic primer which will create a smooth undercoat and base that will allow your top coat to adhere to. It dries quickly and it is easy to clean up afterward with hot water and soap. One of the huge pros of this particular primer is that it is renowned for being able to cover darker stained woods so you may not need as many top coats. In addition to this, by getting the white primer, you are able to tint it to help with the overall coverage. Stix primer is recommended by many professional decorators as it not only covers kitchen cabinets but can be used on a variety of surfaces. It really is a staple for all your decorating needs. As mentioned previously, to add more sheen and longevity to your cabinets, a final coat of a water-based polycrylic is essential. This final coat will prevent scratches and scuffs and give a glossy finish that will not only look amazing, but it will make it much easier to clean! This polycrylic finish is quick-drying, will not stink your kitchen out and doesn’t yellow over time. However, I would not recommend using a polycrylic if you have used an oil-based paint as it will not give as good a finish. For covering latex or acrylic paints, this is an excellent choice. Although it does have a low odor, it is still a paint product and so will emit some fumes so it will still need to be used in a well-ventilated area. Not only is painting your kitchen cabinets time-consuming, it can also be quite expensive (still not as expensive as a brand-new kitchen though!). But, scrimping and trying to save money on quality paint could end disastrously. Quality primers and paint are definitely worth the price tag, and here are some of the brands that the pros swear by. Just as the name suggests, this is a fine paint brand. Based in America, Fine Paints of Europe specialize in oil paints and primers. As mentioned before, oil paints can be a little more difficult to use which is probably why this brand is mainly used by professionals. However, if you are up to the challenge, Fine Paints of Europe offer a huge range of colors for any project and the colors are as tame or as wild as you desire. As an added bonus, if you live in North America, they have professional consultants on hand to answer any queries. Benjamin Moore is the brand that is very popular for home improvement projects and is used by professionals and amateurs alike. This brand offers specific paint designed for every room in the house, which can take a lot of the strain out of the preparation. Similarly to Fine Paints, the color range is astounding and offers options for any imagination. Benjamin Moore as especially renowned for their waterborne paints and latexes which are much easier to use than their oil counterparts whilst still providing the smooth finish required. The fact of the matter is that there are hundreds of products on the market for painting your kitchen cabinets. It really can be quite daunting. But with this guide, you have got some direction towards what products would be best fitted to your skill set. One of the good things about painting your kitchen cabinets is that if you don’t like it, it’s not the end of the world. Yes, it may be frustrating but anything can be fixed. Apart from the primer, paint and top coat, one of the other elements that I have mentioned several times is the need for sanding. I would suggest using a 220 sandpaper to do the initial sanding and then switch to a 120 sandpaper in between the coats so you don’t end up removing all your previous effort. If room allows, try and make a designated area outside to complete your painting tasks. This will not only help allude some of the paint fumes but the airflow will ensure your cabinets dry quicker and evenly. With it being in a designated area, it will also help prevent any unfortunate accidents which could result in a time-consuming clean-up. With all the high-tech equipment that is on the market, you’ll probably be surprised that the best way to paint your kitchen cabinets is a paintbrush and a small roller. The other option is a paint sprayer. Spray painting is an option if you want to speed the process up but can cause more problems if you have never used one before. Spray paint does provide a smoother and more professional-looking finish but can still be time-consuming. If you don’t own a spray gun or have never used one before, you will need to either buy or rent one and do several practice runs before you start tackling your project. You can learn how to spray paint here. And don’t think that you will be able to avoid the dreaded sanding stage by using a spray gun- this stage is still imperative regardless of what tool you decide to use. Spray paint does have its advantages though. If your cabinets have intricate designs or raised panels, spray paint can cover these areas quickly without leaving those dreaded brush marks and it leaves a beautiful smooth finish. If you do decide that spray painting is the option for you, take care to make sure that the whole area is covered, as overspray can be a nightmare, and that you are in a well-ventilated area. Foam rollers and or brushes can be a lot less complicated than using the spray gun. You are able to control the paint coverage much more but this means a lot more time painting. If you decide to use the more traditional method, you will need a foam roller (as it gives the smoothest finish) and a bristle brush. Use the foam roller to apply the paint and then the brush to spread the paint out. When using the brush, make sure that your final stroke follows the grain of the wood to prevent any bobbling. However, this is not to say that using a foam roller and paintbrush are perfect. Foam rollers don’t hold a lot of paint so will need refilling regularly which can be quite tedious. The same can be said for the paintbrush. Luckily, kitchen cabinets aren’t usually very large, however, once you start you will realize that it is a long, drawn-out process. But, if the cabinet is prepped correctly, you will get the optimum results using these basic decorating tools. A more unconventional option for painting your kitchen cabinets, or perhaps just adding a splice of color to otherwise painted cabinets, is to use a sponge. If you are painting the whole cabinet, you would use the sponge similar to how you would use the foam roller and brush. Instead of using the brush to spread the paint, you would use a sponge- still going with the grain of the wood. Or you can get sponge stencils that will allow you to add a design to your cabinets with ease. Prep is key and can be quite time-consuming. 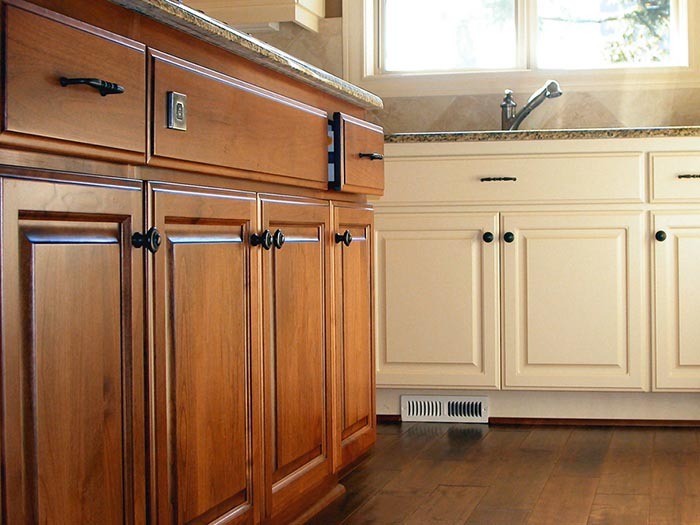 You need to start by thoroughly cleaning all your cabinets, inside and out. Because kitchens are prone to grease and dirt, it is imperative that you remove all of this before you start painting. Any grease or grime that is left on your cabinets can affect the finish of your cabinets as the paint will react with any substances it comes into contact with. Make sure you cover up any surfaces you don’t want to be painted. Mistakes happen and you don’t want to extend the clean-up process by trying to get an oil paint off your marble countertops. Rosin or brown builders paper is inexpensive and can be easily used to cover areas of your kitchen you don’t want painting. It is an easy task that will help prevent future stress. Make sure you know which cabinet door goes where. Before starting your project, you will need to dismantle your cabinets to help with the panting and drying process. How you choose to organize your cabinets is entirely down to you, but make sure it’s a system that works for you. One suggestion is to number your cabinets and write underneath where the hinge would go which cabinet it is. Just make sure that you cover your writing with masking tape so you don’t paint over it. One of the biggest mistakes is trying to rush the process. You need to make sure the paint is fully dried before applying the next coat. If you don’t, the fresh coat could peel off the previous coat or you could end up with bumps and paint bubbles on your cabinets. I know I’ve mentioned it before but it really is that crucial. In between coats it needs to be a light sanding, you don’t want to remove all of your hard work. By sanding, you are simply giving the paint something to stick to. Whether it be before, during or after, it is essential that the cleaning stage is done thoroughly. After sanding, use a vacuum and a tack cloth to remove any of the dust that may be left on the cabinet. If you try to paint over it, you will end up will a bitty finish that will look unprofessional and will not illustrate the time and effort that you have put into the project. Paints have strong fumes and you do not want to expose yourself to them for too long. Make sure you are in a well-ventilated area to help your own health but it will ensure the paint dries quickly. I would also suggest getting face masks to aid your own safety- they are inexpensive from your local home improvement store but are invaluable. I know it’s a lot of information to take in, and I’ve not tried to hide from you how laborious this task can be. But is it worth it? Most definitely! Your home is an expression of yourself and you are able to make it as personal as you like. Plus the achievement you feel after completing this project is overwhelming. Painting your kitchen cabinets takes time and patience, if you rush it you will be disappointed by the results. But persevere. If you do your preparation and follow these steps, your kitchen cabinets will be the envy of all who see them.